Ritz Printing is more than just a business. It's a family tradition going back four generations. 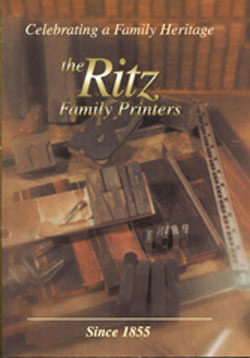 Those of you who have not seen or read the book written by Ernie Ritz: "Celebrating a Family Heritage, the Ritz Family Printers" and are interested in reading about our history, can borrow or buy a PDF version on CD (Mac or PC). Our first E-Book! The hard copy version is out of print but there are copies available in the libraries of all area towns and in every school library as well. Contact us for further info. We're still little more than a "Mom and Pop" operation and we believe that smallness helps us do what we do best: Deal directly with our customers to give them good personal service. At the same time, change and improvement are an absolutely necessary part of doing business and the next few years will see us continually moving towards better service and efficiency. The development and launch of this Web site demonstrates that new direction. We intend to make it easier for our clients to request estimates, place orders, check proofs, or transfer files online. We hope you find it as helpful as we do. We like what we do. The enthusiasm we have for our work enables us to take ownership of our clients' projects. We constantly strive to deliver the highest-quality products possible. There is great satisfaction in delivering a finished product that helps a client reach their goals and objectives.